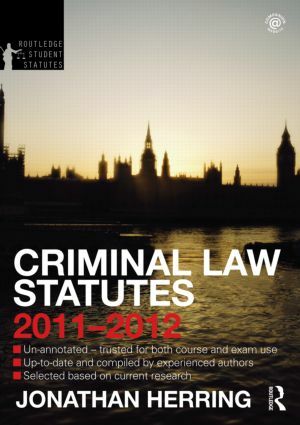 Routledge Student Statutes present all the legislation students need in one easy-to-use volume. Developed in response to feedback from lecturers and students, this book offer a fully up-to-date, comprehensive, and clearly presented collection of legislation - ideal for LLB and GDL course and exam use. Supported by a Companion Website: presenting scenario questions for interpreting Statutes, annotated web links, and multiple-choice questions, these resources are designed to help students to be confident and prepared.